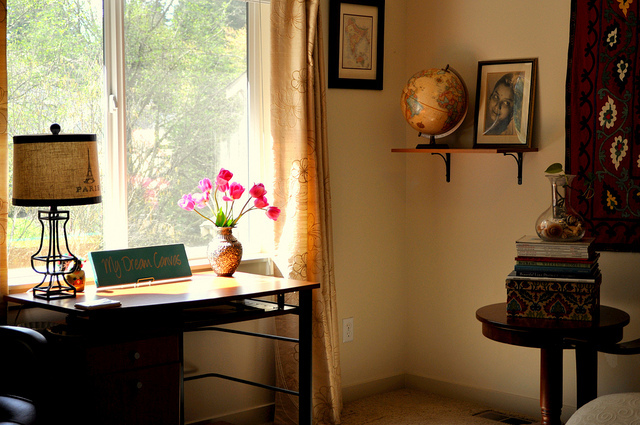 My Dream Canvas: The Perfect Accessories To Create Your Haven! The Perfect Accessories To Create Your Haven! The room that I have been talking about for a while is finally ready :) There are a few other things that need to be done but for now I have my little haven! This room is actually an extension of my bedroom. However, it is more like a room in itself. For years this room was given the step treatment :) Finally it is getting its due. I cleared out all the mess from this room. I need to get a nicer study table, but for now I am using my old one. It is not fancy but it will have to do for now. I wanted to do up this room without spending any money. It is amazing what you can find in your own house when you start looking. I highly recommend it. It is more cost effective and prevents you from rushing out to the nearest store to buy more things that you may not need. Everything in this room has been decorated with things that I already owned. This room follows no trend but follows my heart. I have decorated this room with some of the most precious things in my life. Things like a picture of my Grandmother taken by my Grandfather many...... many years ago! My Grandfather had his own darkroom in his house and developed this print himself. My maternal Grandmother (Nani) and I were room mates for many years in my parents home. She was more of a friend and a confidante than a Grandmother and a very big part of childhood. My Nani was an incredible woman and I miss her everyday! 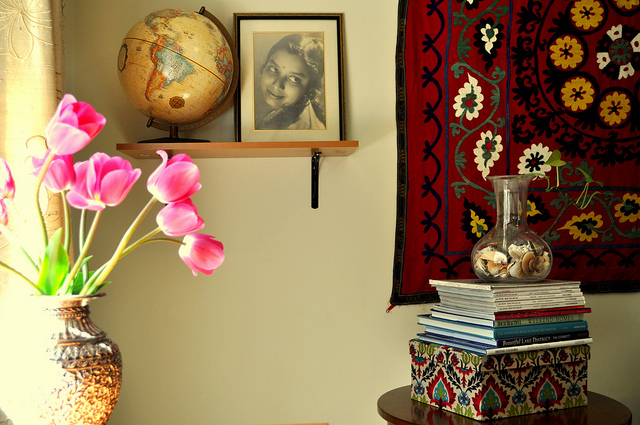 My big red Suzani hangs on the back wall of the room. The Suzani reflects my love for vintage fabrics and my passion for travel. So does the globe which I bought at a flea market in Georgia. 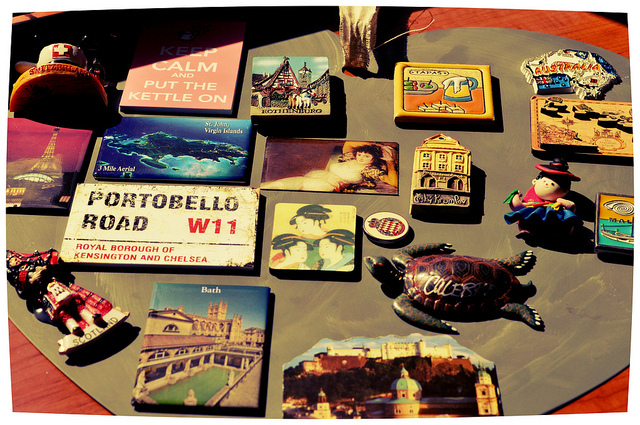 The magnets on the board below are from the different countries I visited. They used to be on my fridge. However my little one likes to play with them and she managed to break quite a few. I have managed to salvage a few and now they hang on the wall in this room. 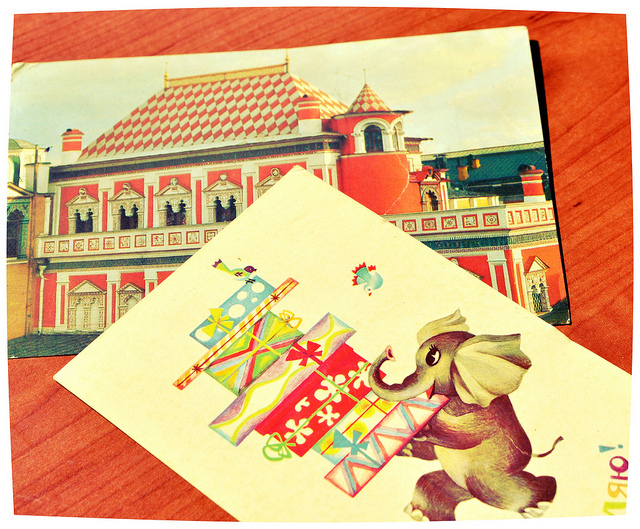 The postcards below are part a beautiful childhood memory. Postcards that my Dad sent me almost everyday for a year when I was five :) The postcards on the back have cute drawings and a few lines that he wrote to me. My mom and I were in India and he was living abroad for a year. I have kept them all these years and now some of them have gone up on the wall in this room. 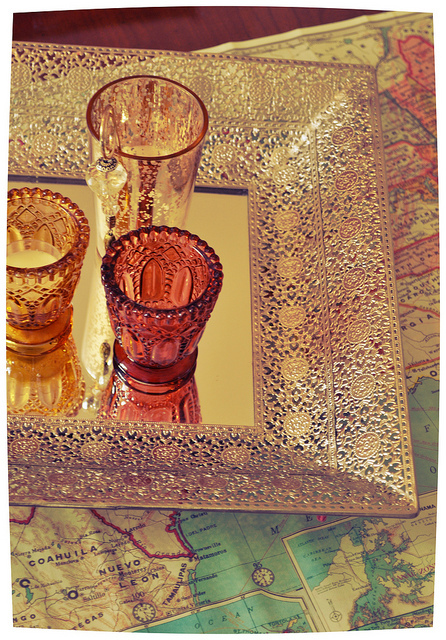 I can never resist pretty tea light holders and vintage maps. This is what I have on the center table in the room. The maps are under the glass table top. I have quite a few of them!! Joining the Open House at No Minimalist Here. Joining the party at Somewhat Simple. Joining Transformation Thursday at Shabby Chic Cottage. Love how the decor has a personal touch. This post reminded me of my nani. Though er lived miles apart, whatever time I spent with her during vacations is cherished. I hardly ever felt the thing called 'generation gap' with her. Love her so much and miss her even more. Close to my heart, she'll stay forever! 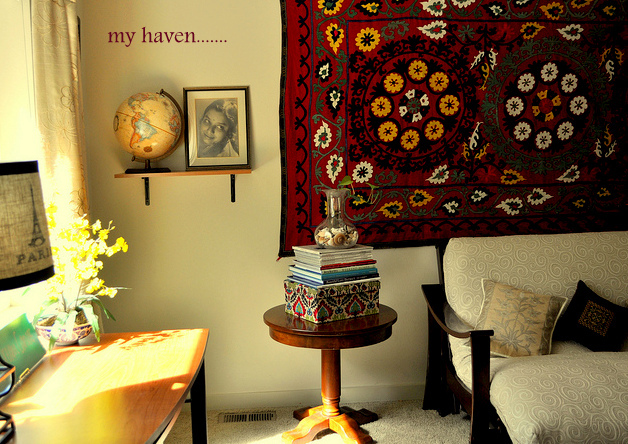 Your new little haven is sweet and serene! I love all your warm colours and textures. 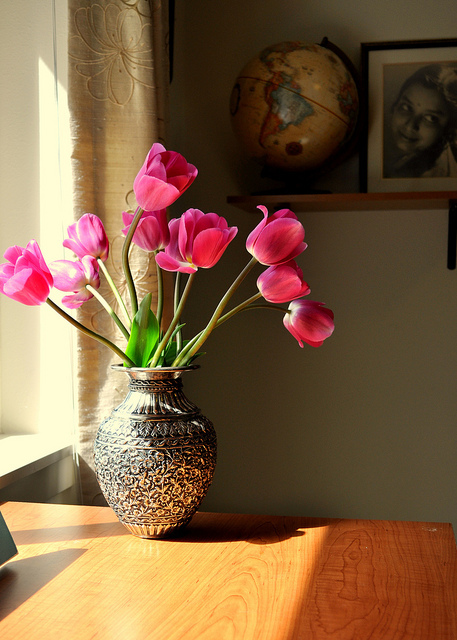 The pink tulips shining in the sun are extra bright and make the space pop! I would love to be a guest in this room! Lovely! And, I love the photo of your grandmother looking so coy at the photographer! Beautiful! That is so beautiful Anu... your room is filled with beautiful and meaningful treasures. Love the pretty colors you chose! First: I love your grandma's lovely picture..such a treasure! I love the fun, pretty and cheerful room and all the elements you've used to decorate it. Thank you for your sweet visit. I'm grandgirls are leaving today and now I have some time, although I'm a little sad, lol.. Enjoy your weekend. You expressed the essence of doing up a home so beautifully in the last para. I have always believed that you don't need money to do a home well, just follow your heart and you will make your a glorious imprint of yourself.